Each year Ginger and I take a road trip together in August. This year we’ve headed North to Oregon and I decided to try keeping a road trip journal using one of the beautiful prompted journals from the Journals Unlimited Range we stock on Pencils.com. This is a great series of Journals, each promoted with relevant data depending upon the topic. There are both mini and normal sizes in a number of topics. All the notebooks are “Made in the USA” and use soy based inks as well so they are environmentally friendly. Would be a nice pairing with our ForestChoice pencils as a gift, but on this trip I’m using my Blackwings and trying out a prototype pencil case. 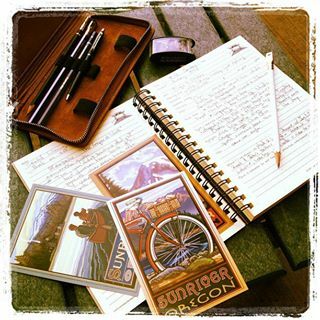 For this trip I selected the Journal entitled, Adventures, My Road Trip Journal. Each day’s entry has prompts related to who you’re traveling with, departure and destination points and stops along the way. There is a technical data section for keeping track of odometer readings, MPG, gas prices, total distance travelled, and the route taken. Also sections for noting highlights, sights and memorable places visited, where you ate and things to remember for the next trip. The back page is open form for notes and journal thoughts about the day. I’m using it to make notes of interesting things Ginger and I talked about during the ride. Also each year we listen to one or two books on CD, usually picking an old classic. This year’s selection is Steinbeck’s The Grapes of Wrath and I’ve taken to writing down a few thoughts of interesting passages we listen to that day. Overall the format seems pretty helpful, though on a down driving day like here in Sun River for a few days the technical sections are less useful, though I did use an app to track our bike ride and there is plenty of space for writing about our wilderness kayak trip today and my fishing trip tomorrow.